What position are your running for in 2019? Why are you not running again? What are you doing these days? Why did you step out of politics? What’s your plan? Your next move? Which party are your joining? These are tough questions – and I need to think of the right answer every time depending on who is asking. The “whats” are relatively easy. But the “whys” are hard. I have spent 9 years in an elective position. And actively participated in 6 local elections. That is from 2001 to 2016. That’s 15 years of my life – immersed in what I always dreamed of as a child. But in 2016 when I took time to see what I have done – I realized I have done all that I needed to do in terms of policy making. As a city councilor of one of the 33 highly – urbanized cities (HUCs) of the Republic of the Philippines, I take great pride in having served this city to the best of my ability. In May 2001, when I decided to throw my hat in politics at the age of 28 – my fears where like maggots in my head – I was asking all the questions – why am I doing this? Politics is only for the rich. I did not even have a house of my own. No rich family name. Lower middle class. I was a four year old lawyer and well, single, but I did not think it was a disadvantage. All I had was my father cheering me up. Like any parent, who thinks their child is a genius. Deep inside – it all felt unreal. Joining a political party, campaigning every night. Shaking hands with everyone and sometimes in the haste of things, even shaking the hands of my own secretary standing among the crowd. Looking for campaign funds was very hard. I did not want to starve people who were helping me. The need to feed my campaigners, buy fuel for all the vehicles used in my campaign, buy posters and stickers – all a daily concern. The first time I ordered posters worth 100,000.00 – I was trembling – telling myself – a hundred thousand could have fed so many families. But politics is like that – I could even be among the lowest spenders – trying to stay within the limit – around P3/voter – so around 750,000 for a councilor in a city of 250,000 voters approximately. I ended up in 18th slot out of around 80 candidates in the race for 12 elected councilors in 2001. I lost, but surprisingly my loss was the reason I ran again in 2004. The poverty, the hopelessness, the joblessness I saw in many parts of my city affected me deeply. I thought I was so poor, not being able to eat the food I want, but others did not even have any food. For the first time in my life, I saw almost every nook and cranny of my city – I had to discard many of my illusions. I saw misery. I saw disease. But I saw hope. I saw a family of four with house as small as a pigsty – and they were eating bananas for lunch – but they gave me one. And my heart was crushed – I had to hide my tears – I went home every night feeling ungrateful for the things I have which I always thought were not enough. And when I saw how campaigns were done – all the fanfare, the political jingles, the colorful nightly meetings, and candidates were briefed by political spinners on what to “say” – I was in a daze. We were assigned a particular advocacy and briefed on what programs we will present to the public – in my mind – I blurted – WHAT??? So people run for the sake of running? No mission? No aspiration? All scripted? I ran because I know what I stand for and who I will speak for. To many – I may have sounded phony just like everyone, insincere, reading from a script – when I said I will speak for women and children, for education, for the environment. The public saw me for the first time – and like I was carrying the “world on my shoulders” – I would not have in fact believed myself if was listening to me. In politics, like in show business – it is really hard to tell who’s acting out a role and who’s crazy enough to really think the Heavens gave him or her a mission. I was among the crazy ones. Crazy to be throwing my hard-earned money from teaching and from my law practice to buy election materials. Crazy. And so despite the circumstances at that time – I ran without a party. I was independent candidate in 2004 and in 2007. These two election years – I was elected as 4th and 3rd councilor, respectively. In 2010, I run for a seat to represent Bacolod in the House of Representatives, but God has a different plan for me. In 2013, I went back as a councilor and landed in the second slot. In 2016, I decided not to run anymore to concentrate on my advocacy to help create ICT jobs and opportunities in the country by helping other cities and provinces. Looking back – when I got to the Sanggunian, I realized being elected is even harder than campaigning. I seldom cry out of loneliness, but anger and frustration are always the main reasons for my tears. And well, I cried myself dry all those nine years as councilor. Mostly, out of public sight. But my eyes were on the goal – the need to be real, not fake. I asked the people of Bacolod to give me POWER. The power to legislate. I promised them I will study and burn the midnight candle – write all the things I promise and deliver them in the form of not only resolutions, but ordinances. I needed to walk the talk. For me policy making is a gift, an art, a craft, a mission and a blessing – to deliver what I have promised during the campaign. I held a smaller stick compared to congressmen and women and senators – but I never thought my policy-making power was any thing less. Today, it is appalling for me to watch our national legislators these days – like clowns in business suits. Good intentions are not enough, one has to truly learn how to meaningfully weld the power to legislate. My years in policy making gave me the rare opportunity to meet some of Bacolod’s great minds, from ordinary people to civic leader. I became their voice and their “pen” – I wrote their aspirations for them. I also saw how policies can push advocacy – make it stronger – and most of all channel resources to it. As a councilor, we were given committees and I realized I cannot just create ordinances that are not related to my committees. In that sense, I need to carefully navigate my way in the Sanggunian. Be friendly to those committees whose support I needed. Despite that I had a couple of ordinances that did not say the light of day because the councilor in charge of the committee on which it falls under – did not lift a finger to support it. Sad. But that is part of internal rules. Referral to committee. To master the art of policy making is a skill that cannot be substituted by theatrical attributes. I am no longer running as a councilor of Bacolod because I have delivered my promises to create ordinances that I have promised the people – concerns, systems and processes close to my heart. Despite the difficulties, I enjoyed and learned from every public hearing, consultative meetings and Sanggunian deliberations for every ordinance. The Gender and Development (GAD) Code of Bacolod City (This 26 paged ordinance was among my masterpieces. To this day, it is supposed to stand as the manual or guide for all GAD projects and programs of the city and all our barangays. On June 30, 2016 – I ended my third term as city councilor of Bacolod with some unfinished ordinances. These are major ordinances to my mind, and so I asked some councilors to look into it and carry on. Every ordinance I penned has a story. Behind every policy where staunch advocates from the private sector – inspiring me and helping me in the crafting of the policies. My sincere prayer, having written, and known by heart, the words of all these policies, is to see these ordinance jumping from paper to reality – policies to guide our city and inspire us. The objectives of each policy are outlined on its face – and its implementation – I fervently believe will contribute to the creation of a progressive and fully-developed city, ready to face the challenges of the future. I have done my part – I have worked hard to argue, revise, argue again, revise again – each and every ordinance, which took many months, some even years to be approved. I thank God for the opportunity to be able to deliver what I promised as a councilor – a policy maker. In its truest from – regardless of how politicians are perceived today – I stand proud of being a legislator, policy maker and law maker of my city and my country. My sincere prayer is for this city to find good leaders to implement my ordinances. Hopefully, these leaders will emerge soon. 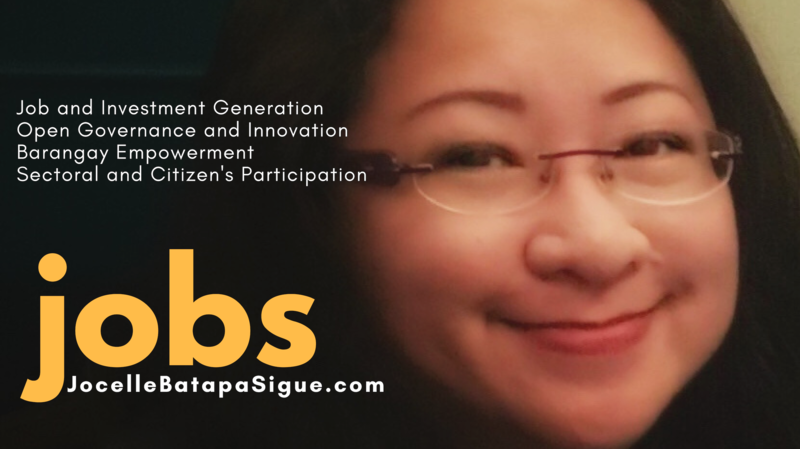 I am encouraging young Bacolodnons – 25 to 30 years of age to follow my path – find your voice – become a politician – a policy maker – stand up for others. Expect defeat – but stand up. Love our city even more. She deserves it. I have done my part – the rest is up to the Greatest Law Giver. Note: For a copy of each ordinance – one can contact me via our office landline at (034) 709-6135. Sharing some of my old campaign pictures and materials still in my file. I have been there – it was an inspiring part of my life but the rigors and the sacrifices are tremendous – I need to take the higher ground to be able to help my city without joining politics.